Dentures, or false teeth, are fixed or removable replacements for teeth. Tooth replacement becomes necessary when the tooth and its roots have been irreparably damaged, and the tooth has been lost or must be removed. Dentures restore the look and function of your smile, are custom-crafted just for you, and are easy to maintain. Today?s dentures are natural-looking, more comfortable than ever, and last for decades with proper care. Dentures are important for older folks because, without teeth, it's hard to smile, talk, and eat properly. But it can be a little weird if you see someone take out his or her dentures. Dentures may not fit as well and will need to be reflected or new ones may be needed. Older adults are at higher risk for oral cancer. Dentures with precision attachments generally cost more than those with metal clasps. Consult with your dentist to find out which type is right for you. Patients receive 2-4 implants at 12-16 weeks after completion of radiotherapy or 8-16 weeks after ablative surgery. Patients then receive conventional dentures at 4-22 weeks after implant surgery. Patients who choose to replace dentures with implants have a poor oral health-related quality of life and that some of these issues remain post-treatment. These issues may continue post-treatment, but to a lesser extent. Patients don't care what you know until they know that you care may sound clich but it is our philosophy. Just give us a call, you won't be disappointed. Lower CuSil dentures are prone to breakage if the patient is a heavy bruxer (grinder), especially if the remaining natural teeth are located in the front of the arch. This is because the holes that allow the penetration of the natural teeth weaken the architecture of a lower denture. Lower dentures are the real challenge, since they are retained mostly by the muscles of the lips and cheeks, and the tongue. Fortunately, now there is a new, relatively inexpensive way to stabilize the lower denture. Teeth whitening, reshaping natural teeth, bonding of tooth-colored material to teeth and porcelain veneers are procedures commonly used to modify a smile. Teeth move and shift very quickly without the crown in place. Sometimes it is not possible to reuse the crown if the teeth have shifted significantly, requiring the dentist to have to make a new crown. Dental implant dentures require a two-step process. First is the surgical implant insertion stage and the attendant headling process. Dental discomfort is said to have caused him to forgo giving his second inaugural address. Eating, smiling, and talking all must have given him great discomfort. Dental implants may be the solution for you! When it comes to replacing missing teeth, dental implants can be a much more convenient solution than the traditional dentures or removable bridges. Dental implants provide several advantages over other teeth replacement options. In addition to looking and functioning like natural teeth, implant-supported full bridges or dentures are designed to be long lasting. Dental implants are becoming the alternative to dentures but not everyone is a candidate for implants. Consult your dentist for advice. Dental students at the University of the Western Cape, as part of their quota requirements, construct double the amount of acrylic partial dentures compared to metal ones. The reason for this is due to the large partially dentate population, who cannot afford its more expensive alternative. Dental implants are a great alternative for people who are in generally good oral health that have lost their teeth due to an accident or have lost a single tooth or teeth due to peridontal disease. Single tooth implants actually rely on your other teeth for support so they can be a tooth saving solution in many ways. Full dentures consist of a pink acrylic base holding a complete arch of teeth. 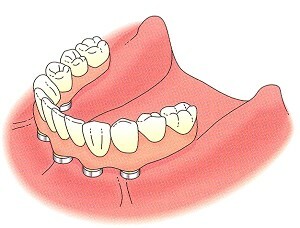 On an upper denture, the base conforms to the dental ridge at the front of the mouth and extends over the palate. 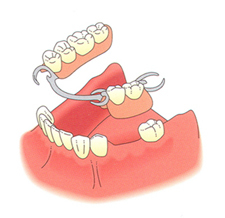 Full bridges or dentures are created to attach to the implants, literally locking the teeth replacement into place. Full dentures stay in place by resting on the gums. Fitting a set of dentures usually takes several visits with the dentist. Implants and )Tj T* [(bridges may r)18(esemble the \223feel\224 of r)18(eal )]TJ T* [(teeth, but they may be mor)18(e expensive )]TJ 0 -1.222 TD [(than dentur)18(es. Implants are artificial teeth surgically anchored to the bone. Bone grafts may be used to strengthen the bone so it can better support the implant. Implant can also help with the retention factor. Instead of merely placing the implants to serve as blocking mechanism against the denture pushing on the alveolar bone, small retentive appliances can be attached to the implants that can then snap into a modified denture base to allow for tremendously increased retention. 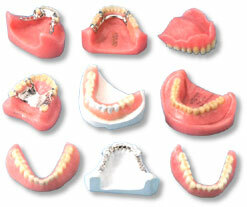 Complete dentures are used to replace missing teeth for people with no remaining teeth. Dentures may also be used for people who have lost several teeth. Complete dentures, overdentures, and removable partial dentures should be removed at night while you sleep. This enables the gums to be bathed by saliva, which has important properties for controlling the naturally occurring flora found in the oral cavity. Examined together, the findings indicate a significant opportunity for dental professionals to educate patients on how to feel more confident and comfortable with dentures. Examination of his oropharynx was unremarkable but fibreoptic laryngopharyngoscopy showed inflammation of the supraglottis with pooling of saliva. The initial diagnosis was supraglottitis and intravenous antibiotics were started. Wear the dentures as much as possible and practice reading aloud to get used to the feeling of talking. Learn more about talking with partial dentures with information from a licensed dental assistant in this free video on dentures. Wear a temporary denture if you have to, and see if you can handle it. If it is satisfactory, then don't get implants. The denture is still removable, but there are no clasps because the RPD is retained by the implants.